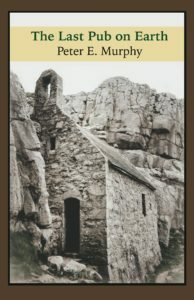 From the very outset of Peter E. Murphy’s The Last Pub on Earth – billed as “the story of the afterlife and times of the unfortunate Garry Morgan,” an alter ego created by the poet – it’s clear that this collection of poems is an unusual (and unusually intricate) portrait of a drinker adrift in the self-pity that will eventually prompt his recovery. It’s a life painted through bottle glass, all at once warped and sharply defined. Moving one’s way through the collection is like trying to transcribe the dream you’ve just awakened from – slippery details, dissolving logic – and knowing you’ll never succeed. That’s the dark, startling beauty of this collection: Garry Morgan never arrives anywhere he doesn’t expect to arrive. His course is certain. He may not know his place in the world anymore, but he knows drinking in the way that Peter E. Murphy knows how to turn syllables into slipknots. Murphy sketches the Welsh countryside in stark, jagged lines, as his alias “roams the Cardiff arcades,” perpetually heartsick and hungover. In “Identity Theft,” Murphy “tries to make a life but gets it wrong,” winding up as a person who “used to be someone but doesn’t remember who.” His life has abandoned him – a feeling that drinkers know all too well. In fact, “What Did I Do With My Head?” is as blistering a poem as it is an ode to blistering hangovers: “fresh scrubbed with alcohol and smelling like the Brains beer he drank all night,” he “blunders into the Cardiff daze,” an aimless speck against the fray. “Obsessing the Sabbath” is the book’s centerpiece, a heartbreaking, elegant poem that has a familiar drift-awake quality that speaks to every alcoholic alive. When he’s not finding himself in strange surroundings, Murphy’s persona Garry Morgan is as much dead as he is alive. The Last Pub on Earth draws a clear narrative arc, but it is anything but linear in the timeline of the heart. Garry telescopes back and forth through time, drunkenly fixating on the past, ignoring the present, and giving up on the very idea of a future. “Death in Cardiff” is straightforward but readers won’t want to let Garry go – we come to care for him in all the ways that he’s given up on the idea that he’s worth anything. It’s a deeply affecting collection of a life neither mourned nor lived. Paul Fuhr lives in Columbus, Ohio. He is a writer on addiction and recovery for AfterParty Magazine. He’s also the host of a weekly podcast (Fuhrious) and the author of the biography Mohawk.